Furniture and furnishings retail in India has grown urbanization, increasing access to branded furniture steadily to become a USD 28 Bn opportunity- with and growing willingness to upgrade to premium ~60% of the market being furniture (~USD 17 Bn). Over next few years, we expect the category to accelerate in growth- driven by continued. Urbanization, increasing access to branded furniture steadily to become a USD 28 Bn opportunity- with and growing willingness to upgrade to premium ~60% of the market being furniture (~USD 17 Bn). furniture. Furniture market has historically been highly fragmented- with 86% share of sales from unorganized channels. 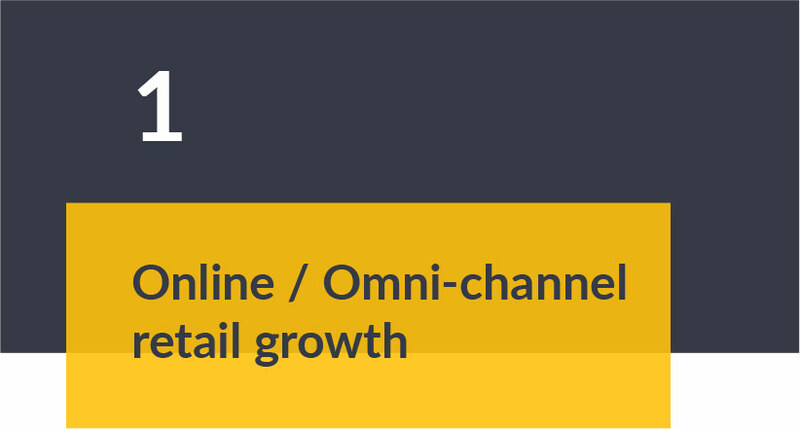 We believe that this is set to change- with strong growth in online channels, organized share can potentially reach ~20% by 2022. Large products like beds, sofas and wardrobes dominate the market, with little change expected in this mix going forward. 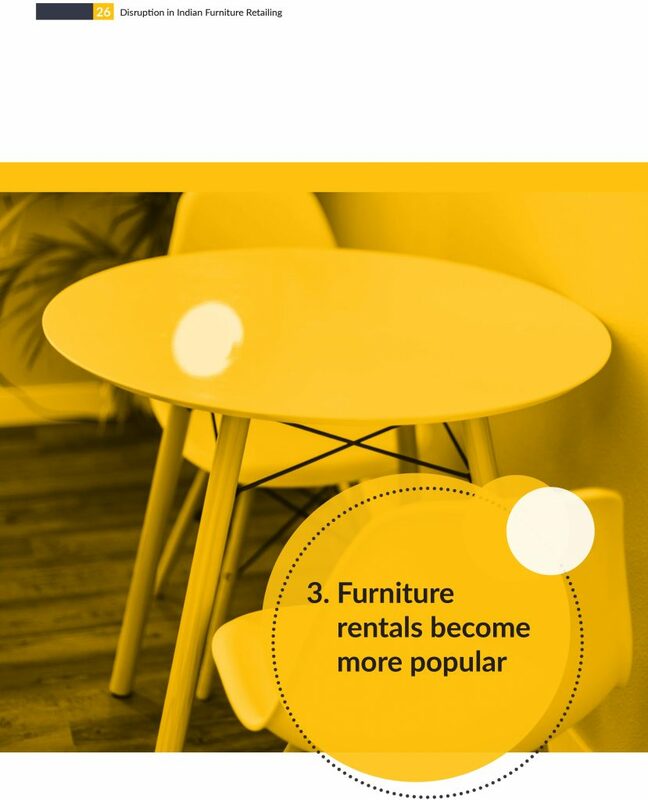 Two megatrends are changing the demand side of furniture buying- 1) increased digitization and 2) growing share of urban millenials- which is causing a major disruption to the customer needs and purchase journeys. of demand. Additionally, buyers are extensively digitizing their purchase journeys- right from research to payment stage. Retailers need to not only actively look at offering superior digital journeys to their customers, but also fundamentally rethink the very nature of their offerings for these segment. The aforementioned digitization trends have its roots in the advent of Reliance Jio and easy availability of cheap smartphones, which has led to an exponential rise in 'digital shoppers' in India. are highly engaged online, from discovery to purchase stage. This population is driving the growth of online furniture retailers and other similar players in India, and this long term trend shows no sign of stopping. We believe we are only at the start of the digitization wave. With the impending mega launch of Reliance Jio Fiber and similar home broadband services, we expect an explosion in the count of digitally native users in India- with their number expected to double from the current to reach ~190 Mn by 2020. This development will have far reaching consequences for all industries- from content to transportation to finance. 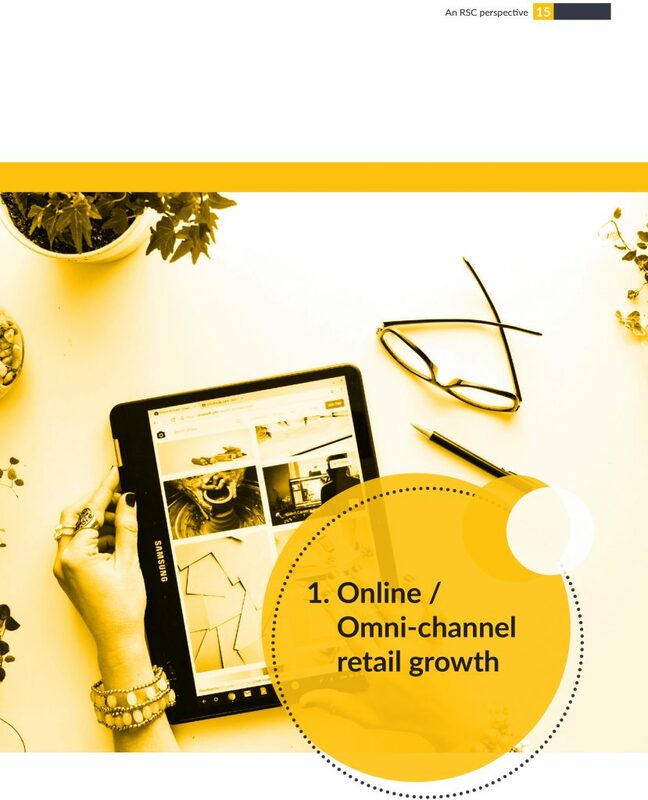 As such, retailers including in furniture space need to actively craft a strategy to identify and solve the needs of this emerging digital population in order to stay relevant. The digitization wave has impacted retailing of all categories in India- big and small. Smartphones stands as the most digitized category, driven by exclusive offers and strong online distribution. The online success of smartphones and offline shutdowns also holds important lessons for traditional retailers on not missing the digital bus. 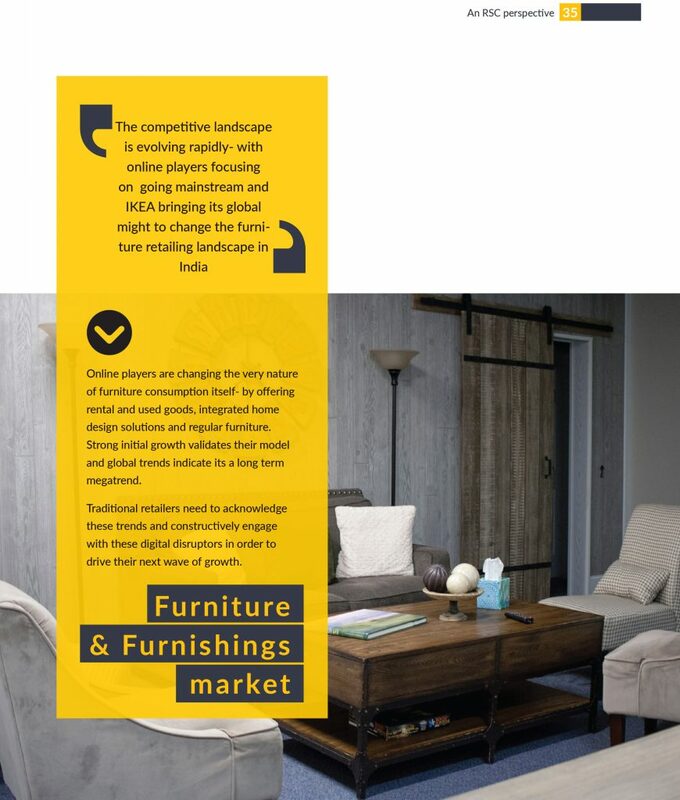 high level of fragmentation in furniture retailing and lack of price transparency and product standardization, we argue that the furniture category is equally (if not more) ready for a digital disruption that solves for the current 3P problems of the sector around product, price and platform. Another reason why we are bullish on the future of online retail in furniture category is the high % of digitally influenced purchases. These are purchases where some part of the customer journey takes place online. Here, India stands at par with its more digitally evolved peers and furniture category in India stands at par with more digitally evolved categories. On the supply side, 4 mega trends are disrupting furniture retail. These disruption are changing not just the customer journeys but also reimagining the offering itself. Furniture retailing in India has traditionally been highly fragmented and unorganized (86% in FY18). This has been caused by high offline rentals along with challenges of consolidating the supply and demand at a national scale- leading to absence of many nationally recalled brands. Over the last few years, e-tailers have put in significant efforts to solve these issues. On the supply side, they have worked to organize their suppliers- either by bringing them onto a managed marketplace or by creating private labels. On the demand side, a combination of strong marketing and offline experience stores is driving demand creation. Together with heavy investments in purchase enablers like strong logistics and high quality selection, these e-tailers have grown rapidly and are poised to grow their share of total furniture market further to ~8% by 2022. We expect that this trend over time will drive online leapfrogging of offline organized retail in India- similar to what is playing out in other countries like China. 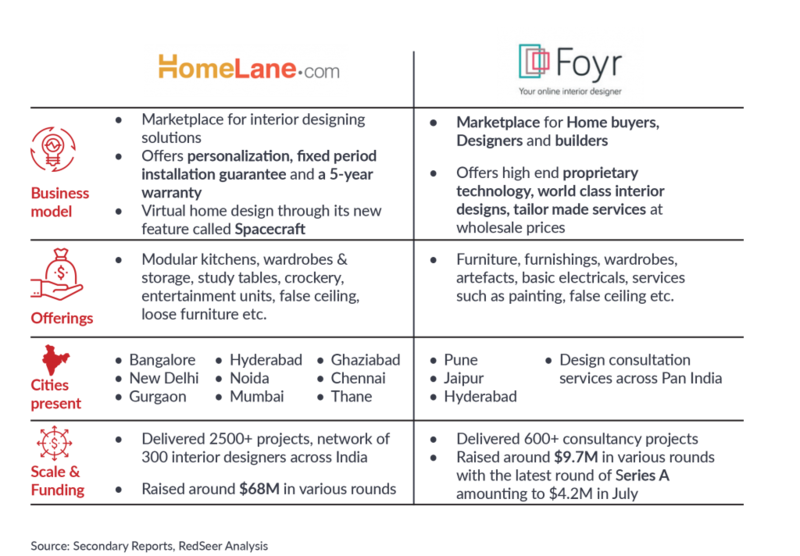 The online furniture market is being driven by ~5 year old players Pepperfry and Urban Ladder. 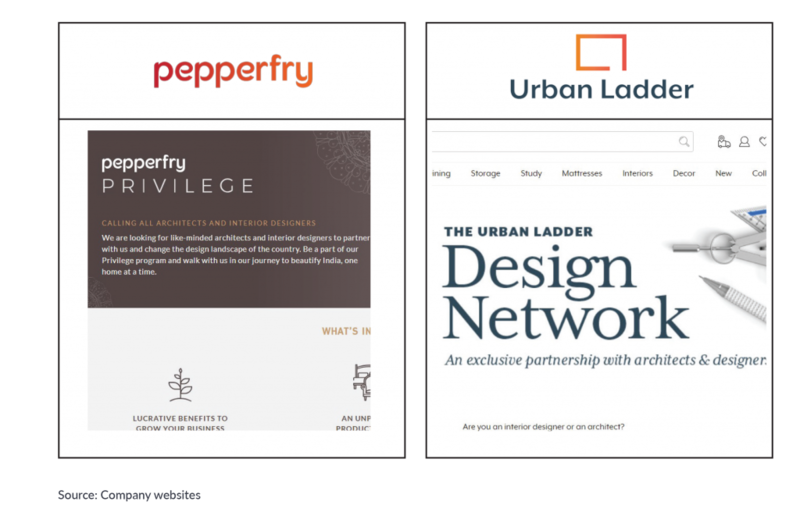 These players have attacked the market differently on the supply side – with Pepperfry focusing on creating a managed marketplace supported by private labels while Urban Ladder is a wholly private label platform focusing on premium curated offerings. a cumulative GMV of ~USD 250 Mn. 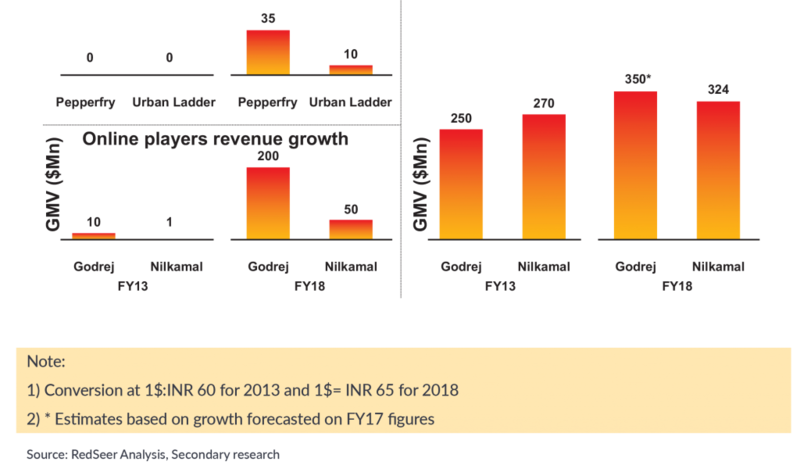 While Pepperfry has managed to gain a significant lead, it is still early days for the industry and players and investors will need to continually invest in supply, demand and enablers to drive market creation and growth over the long term in this capex and opex heavy category. In their early stages of growth, both the e-tailers faced challenges of solving the 'touch and feel' problem in furniture e-tailing. This drove a push into creation of a network of experience stores that enable users to experience the products before buying- thus providing a strong level of trust which was missing online till then and which was a habitual need of any furniture buyer in India. Post this expansion of the store network, both players have seen a strong growth in their overall sales- and grown to reach the scale of many of the major offline retailers. The stores have not only enabled 'last mile order conversions' but also driven discovery and awareness of the platforms- by virtue of being situated in high traffic areas like airports for example. Having consolidated their presence amongst the traditional digitally active furniture buyers, furniture e-tailers are targeting the next wave of furniture buyers. Focus is on expanding to a wider set of income groups and on younger buyers. reduces the price barriers to purchases thus bringing many new segments into the fold. 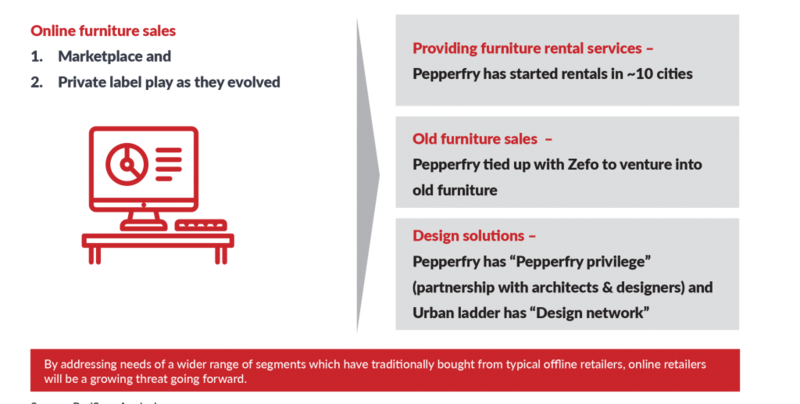 In tandem, Pepperfry is also targeting the buyers who want a turnkey solution that takes care of design as well. 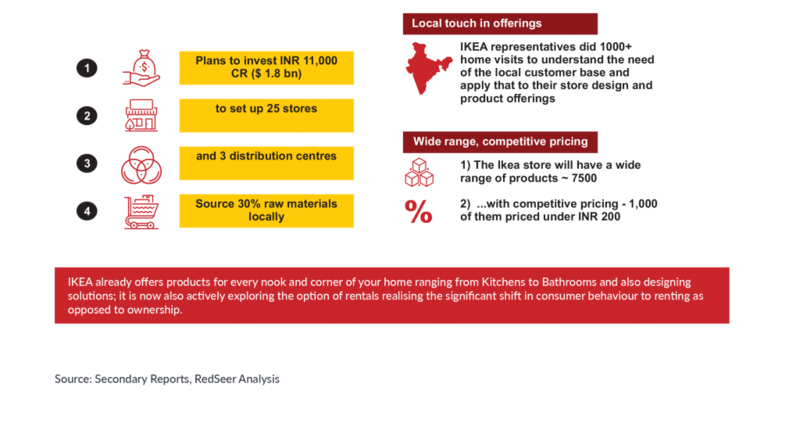 These product expansions put Pepperfry in direct competition with specialist players like Furlenco and Livspace- which should be an interesting dynamic playing out in the market. engagement with platform including on content, overall experience. Verticals like Nykaa Firstcry and others precisely this strategy to emerge as both sales and NPS leaders in the space. Given their adoption, We see furniture category also being disrupted by this trend going forward. Livspace is the leader in offering solution based services in furniture retail. It has replicated the traditional buying experience by creating a platform that brings together consumer, designer and suppliers into an online/offline world. 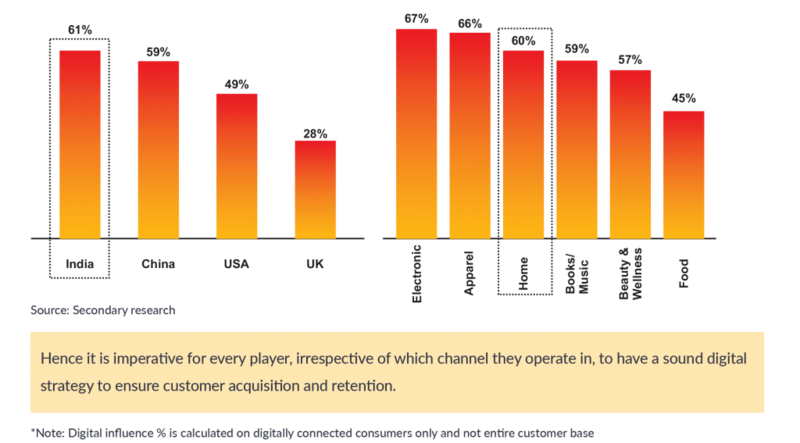 This play enables it to target a wide range of customer groups who may not be interested in pure-play product offering. Use of pre-designed looks and deployment of virtual reality is a further enabler that Livspace is using to pull off this offering. Livspace is using a combination of organic growth across cities along with acquisitions to stregthen both the demand and supply side of its offerings. Growth accelerated in FY18 to reach USD 17 Mn of GMV, up 380% from previous year- showing strong traction for a solution based offering in the market. Having seen the strong initial traction received by Livspace and similar players, larger horizontals furniture e-tailers have launched competing offerings. While their high brand recall and deeper pockets should give them a leg up over the specialists, it remains to be seen whether their offering quality/breadth would be competitive with the specialists (and with the offline players). 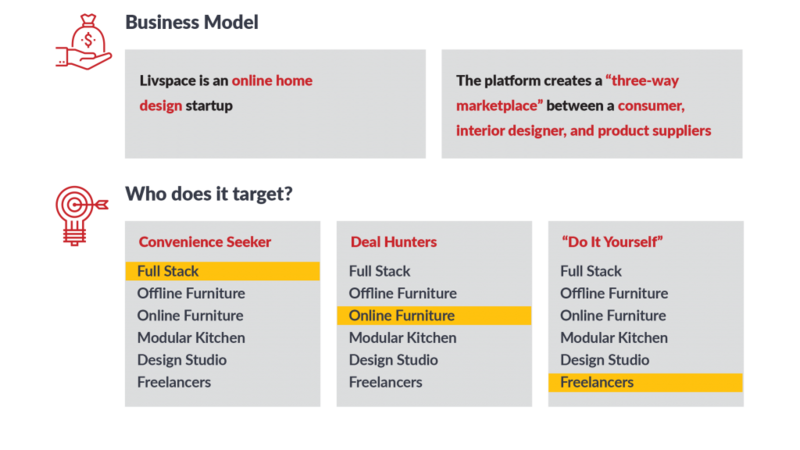 Smaller players have also been driving the growth of online home solutions market- with a focus on creating a marketplace for designing solutions. demand for these smaller player, many of them would likely need to engage with bigger players- either via partnership or M&A route- in order to gain significant traction. The mass popularization of smartphones since 2007 has led to an exponential growth in the so-called 'sharing economy' companies. These companies have catered to needs of millenials by offering 'services' instead of products for a wide range of categories including cars, homes etc. that prioritize convenience over ownership and which offer high flexibility to the always mobile millenials. 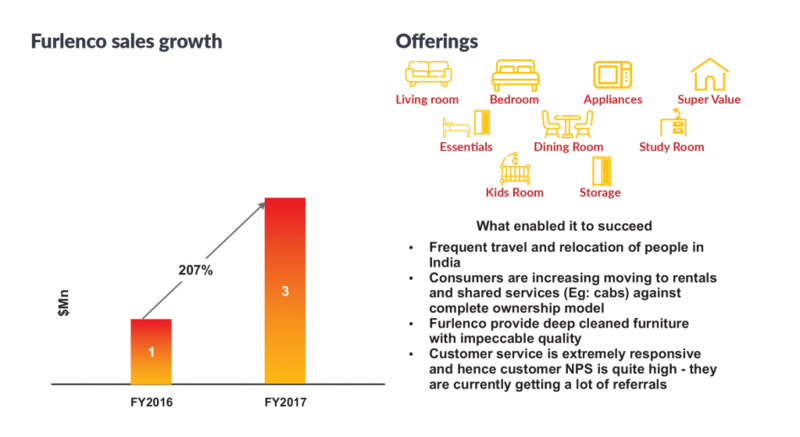 With explosive growth in sharing economy companies, more and more sectors and even traditional incumbents are embracing this new consumption pattern. Furniture retailing is also being engulfed by the sharing economy wave. Players like Furlenco and Rentomojo have grown rapidly in a short span of time and have started to offer all varieties of product rentals and associated value added services for growth. Investors are betting heavily on this market, as observed by USD 40+Mn of funding received till date (although with a small GMV to show for it). Furlenco has emerged as a leader in this yet nascent market. Its success levers? Largely around ensuring a 'high quality experience' for the customer- enabled in turn by high quality furniture and superior customer service. Superior customer service has turned out to be the big differentiatior for Furlenco to create much needed customer trust- since this category is bogged down by concerns regarding the product quality/cleanliness and lifetime. 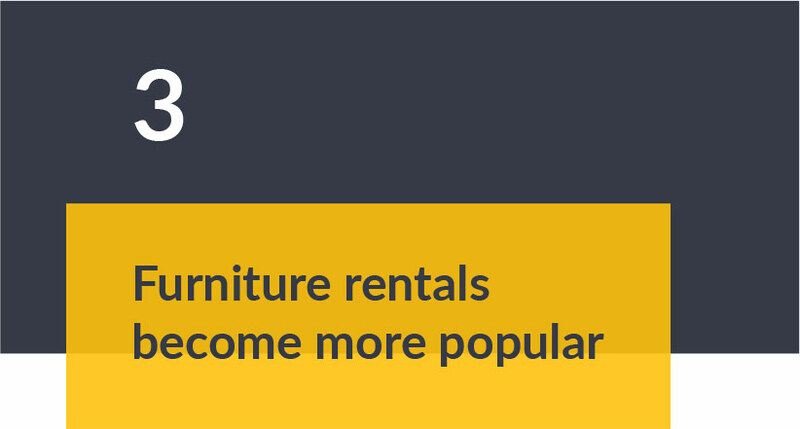 Investors are betting on furniture rentals growth as a long term megatrend rather than a blip on the radar. Global case studies would validate their hypothesis. Players like CORT have emerged as a one stop solution for all types of personal and corporate relocation services, with furniture rental at its core. 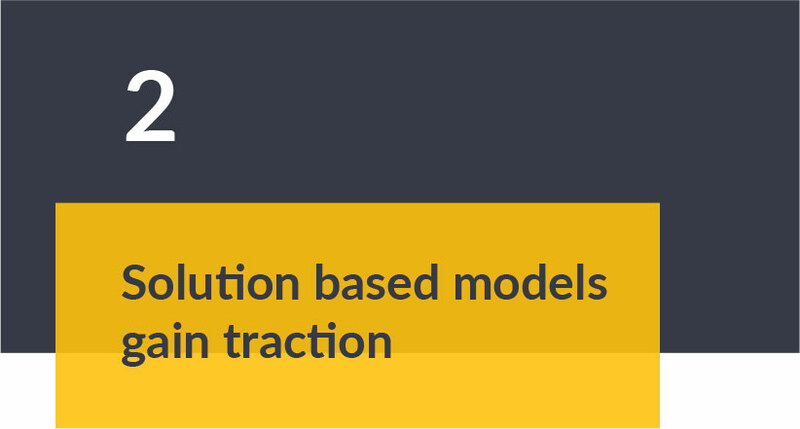 High revenue growth and successful expansion into 100+ offices globally has proven the model- and perhaps provides an indication of how such models could evolve in India as well. As if digital disruption was not enough, traditional retailers in India also face the spectre of a global giant-IKEA. IKEA has built its cult brand on a combination of high quality affordable products sold at giant stores that offer a comprehensive shopping experience. 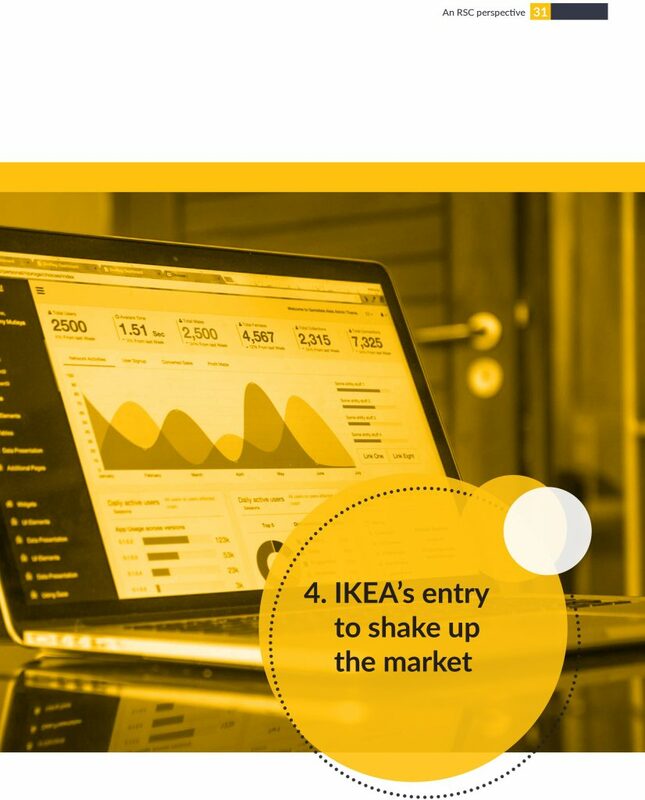 It is a combination that has been remarkably durable and financially successful across geographies- IKEA now has a 355 stores across continents and a foothold in all of the world's major markets- including in China where it entered in 2006. IKEA's strong focus on offering a value price for its customer is enabled by their local sourcing focus and high investment in R&D. Recently, it has also expanded its online offerings and augmented it with latest technology to drive sales. We believe that these strategies should give them an edge in their Indian market entry- where users value pricing above all other factors and which is in midst of an online retail wave. 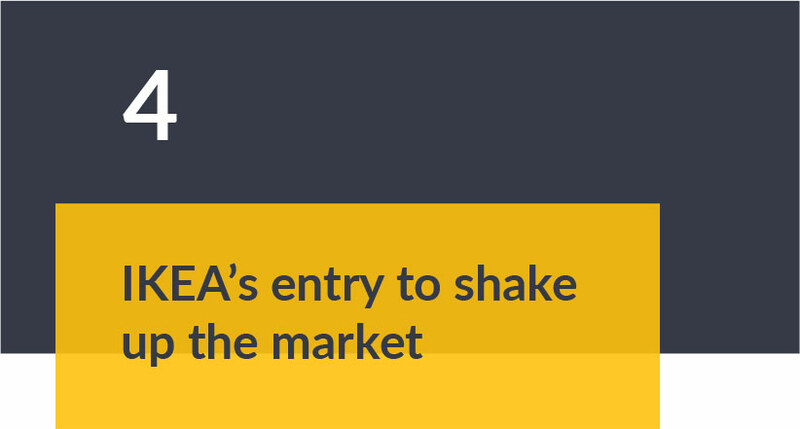 IKEA's ambitions in India are clearly vast- as indicated by its aggressive expansion plans and the vast amount of committed capital- with a significant share of its capital invested in 'Indianising' its product offerings and store experience. 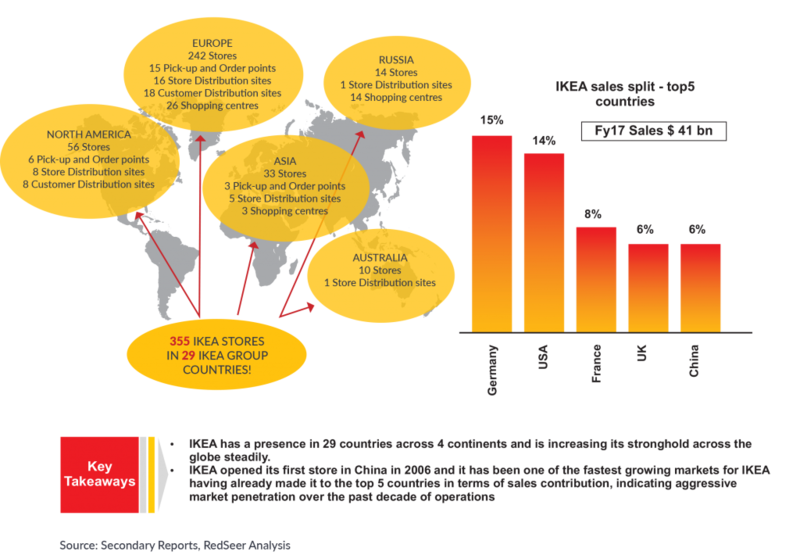 whether IKEA can replicate its global success here in the longer term. However, initial signs indicate that it has made a strong start in the market and traditional players will find it a force to be reckoned with. Digital disruption is changing the market landscape significantly and is unquestionably a threat for Indian traditional retailers. 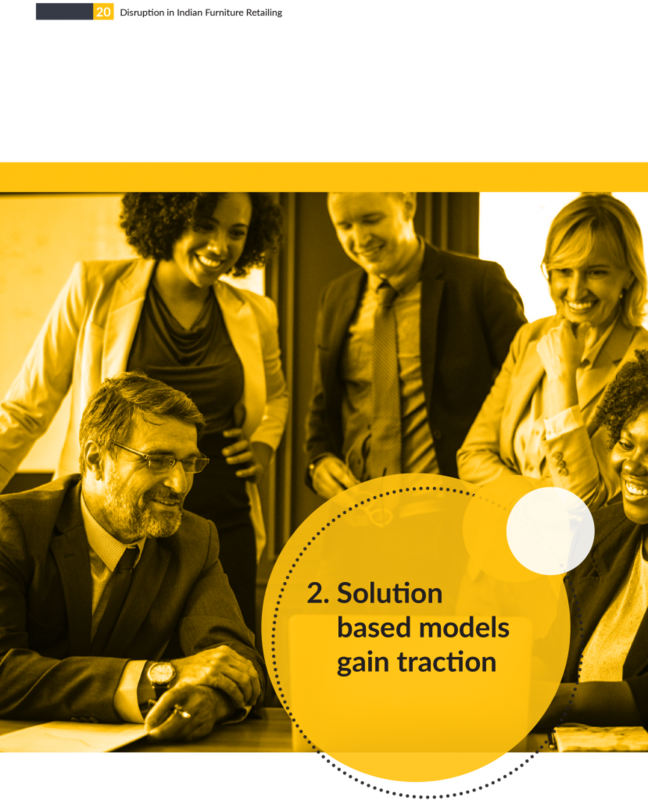 However, retailers can survive- and even thrive-by embracing these changes and tackling them head-on with a coherent strategy. 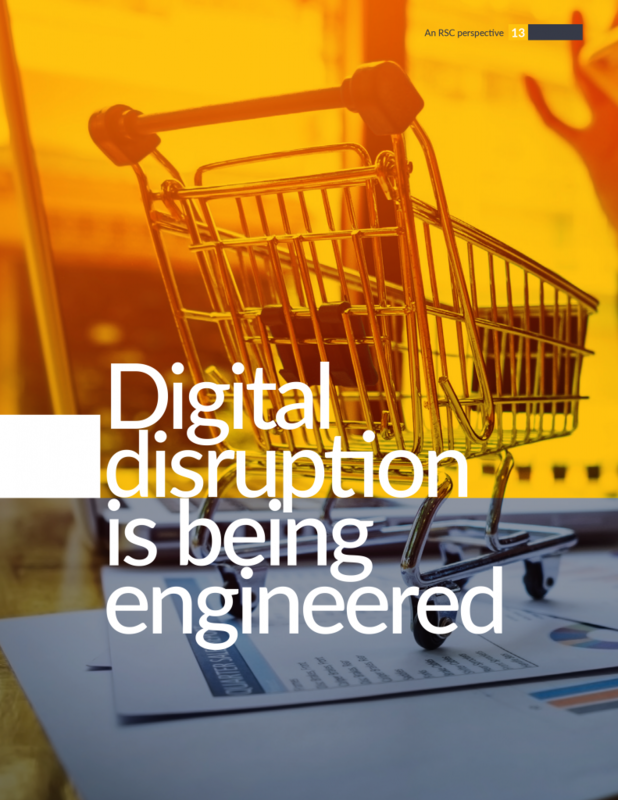 leveraging their strong assets – a wide store network, a strong brand and a vast product portfolio- traditional retailers can potentially compete effectively with digital disruptors. 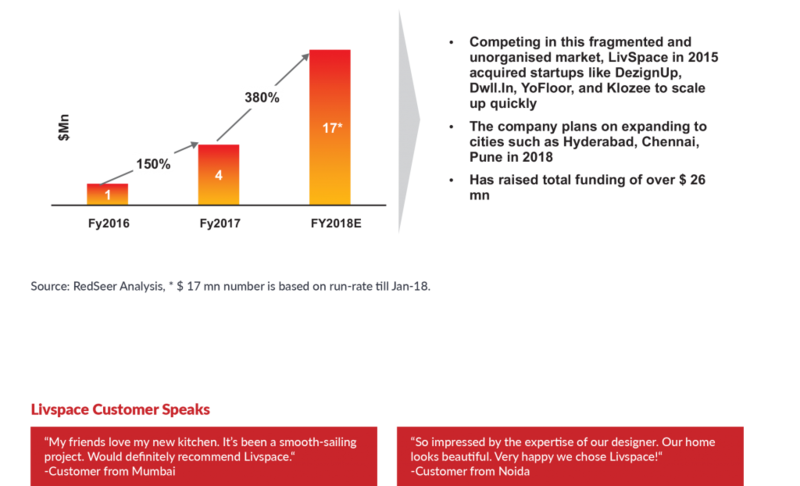 What will it take to convert this potential into reality for traditional furniture retailers in India? 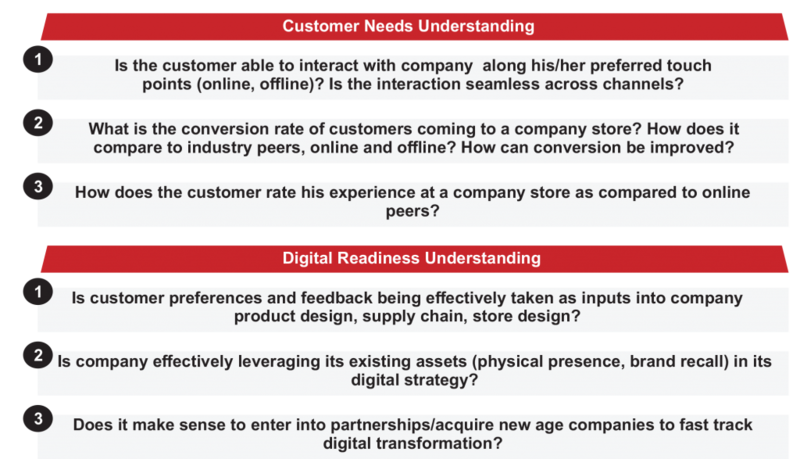 Converting this vast potential into reality will need an in-depth understanding of the customer and one's own readiness to ride the digital wave. This will need deep customer insights backed up research along with a strong understanding of the organization and what is needed to make it ready for a digital future. 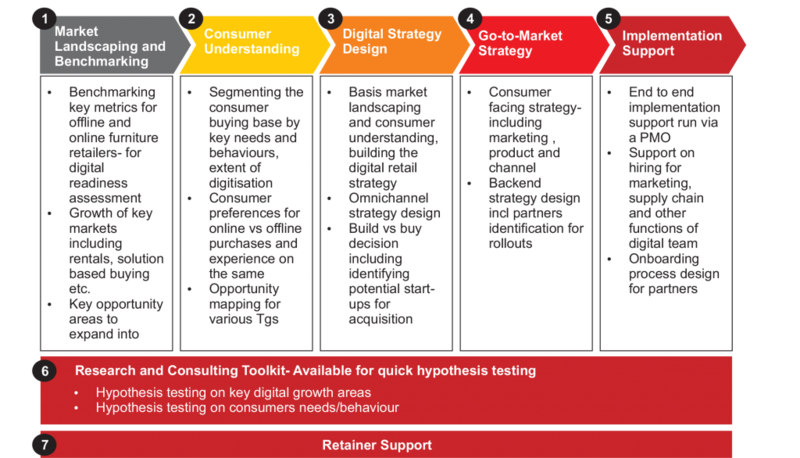 by pioneering research approaches supports traditional retailers throughout their digital journey- right from market understanding to actual implementation.